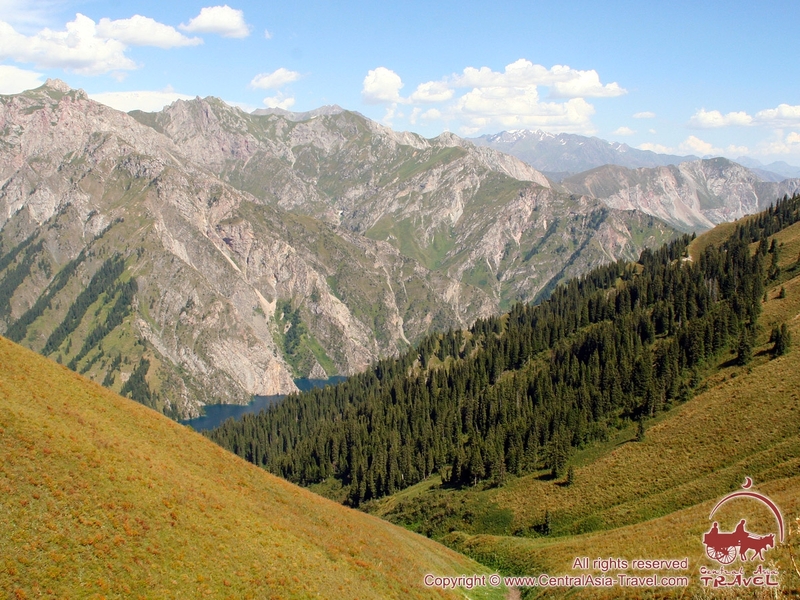 Lake Sary Chelek in Kyrgyzstan. 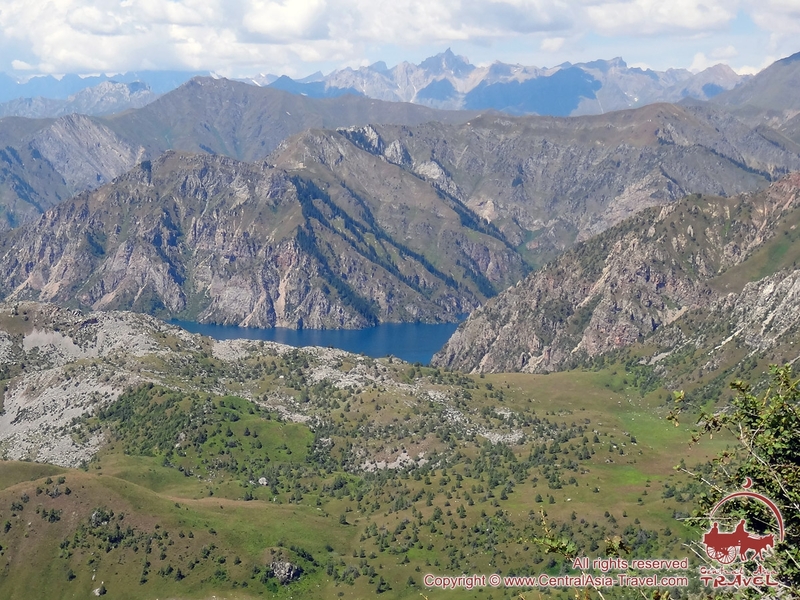 Lake Sary Chelek and the mountains around it remain the most popular part of the eastern Chatkal Range. Best time to travel in the region - from June to September. 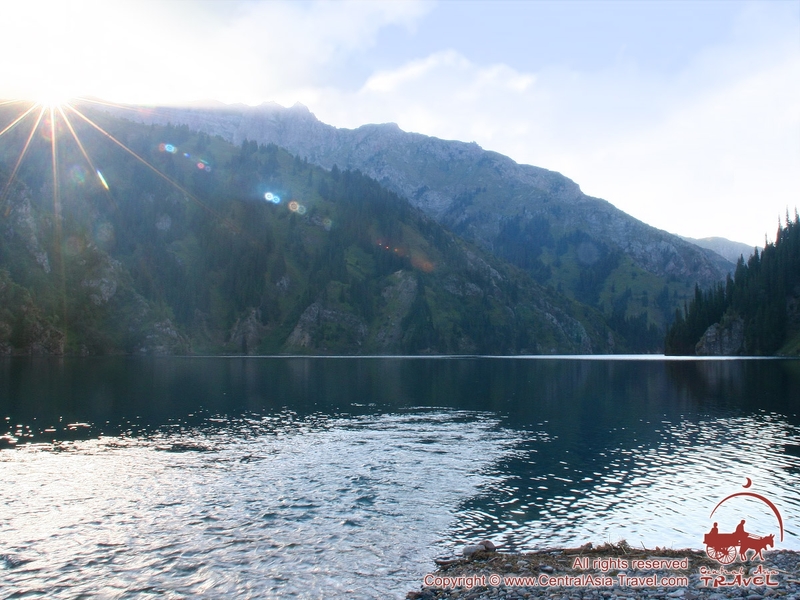 Lake Sary Chelek is one of the most beautiful lakes in Central Asia, the lake itself and the surrounding picturesque mountains being a very popular attraction of the Chatkal Range (the western Tien Shan). 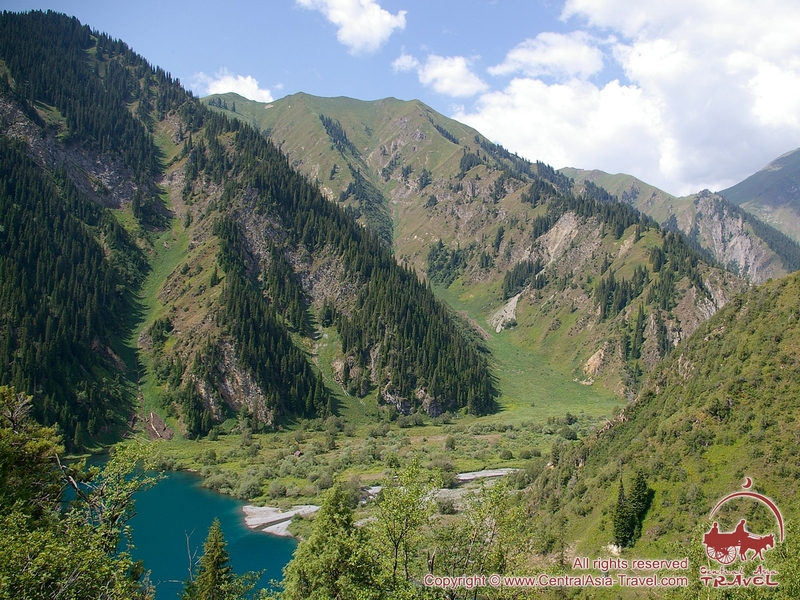 The lake is situated in the western part of Kyrgyzstan, 500 km from Bishkek and 300 km from Osh, at an elevation of 1,940 m above sea level. 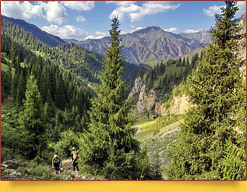 It is 7.5 km long, occupies an area of 507 ha (about 1,200 acres) and is included in the territory of the Sary Chelek Reserve. 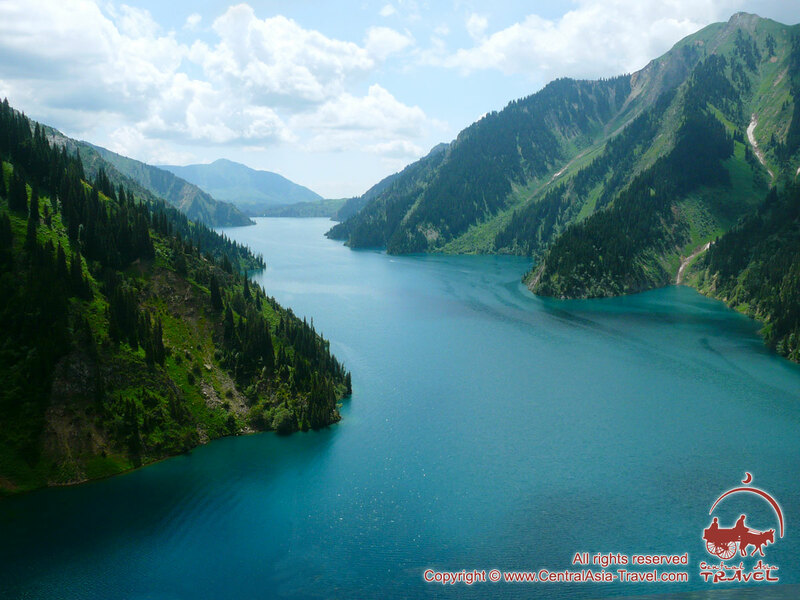 Sary Chelek is the third deepest lake of Central Asia and the second in Kyrgyzstan. 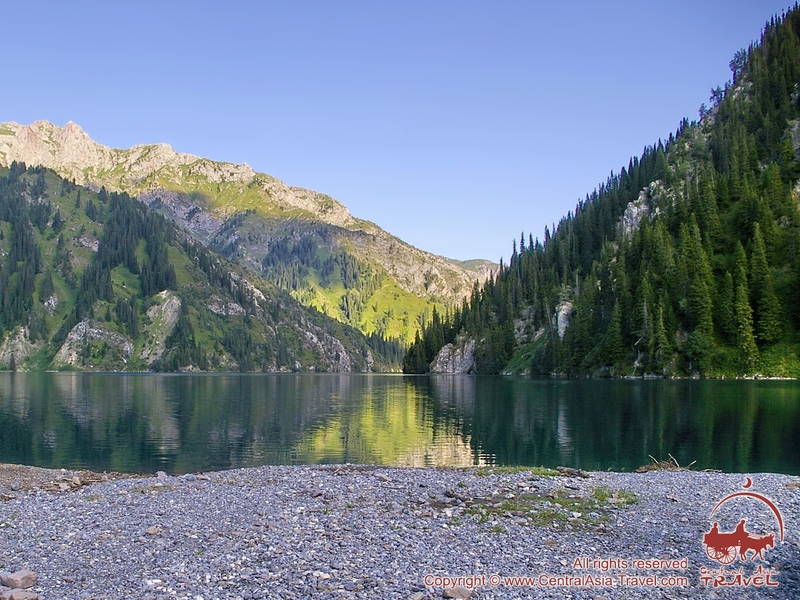 The temperature of the lake’s water rises to +19.8°С in summer, while in winter it ranges between +4°С and 0°С. 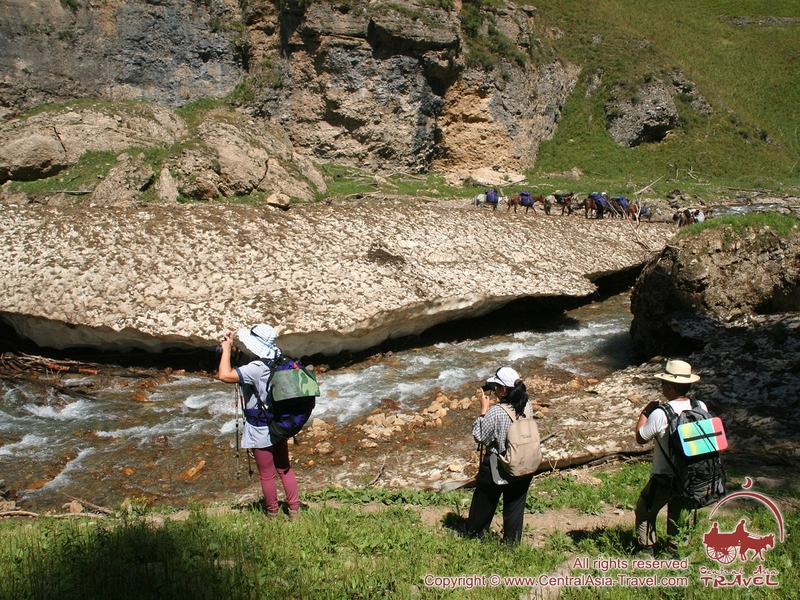 Sary Chelek receives water from numerous little streams flowing into it from the surrounding mountain gorges, to be a source for the river Kojo-Ata. 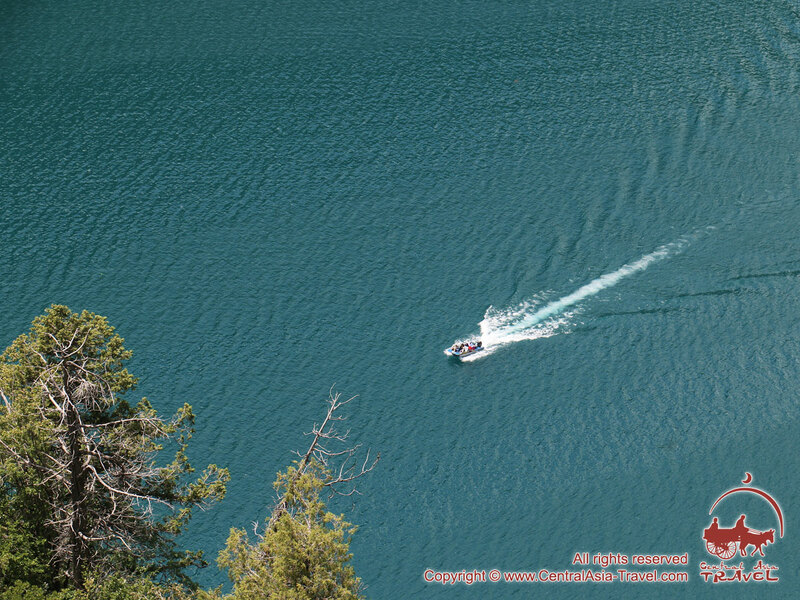 The steep shores of the lake, sometimes passing into sheer walls, fall into the unfathomable waters of the lake, which in some places is 234 m deep. 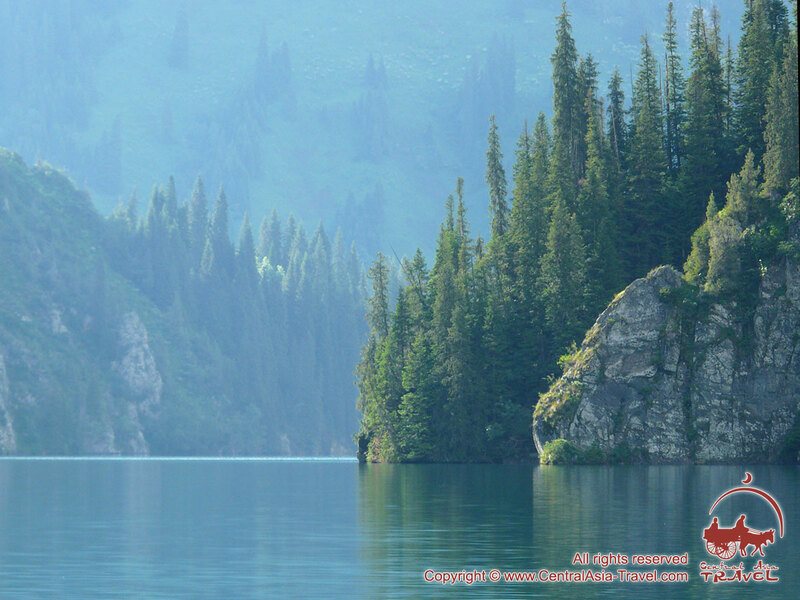 The northern shores of the lake are covered with slim firs and spruces peacefully contemplating their beauty in the mirror of the lake. 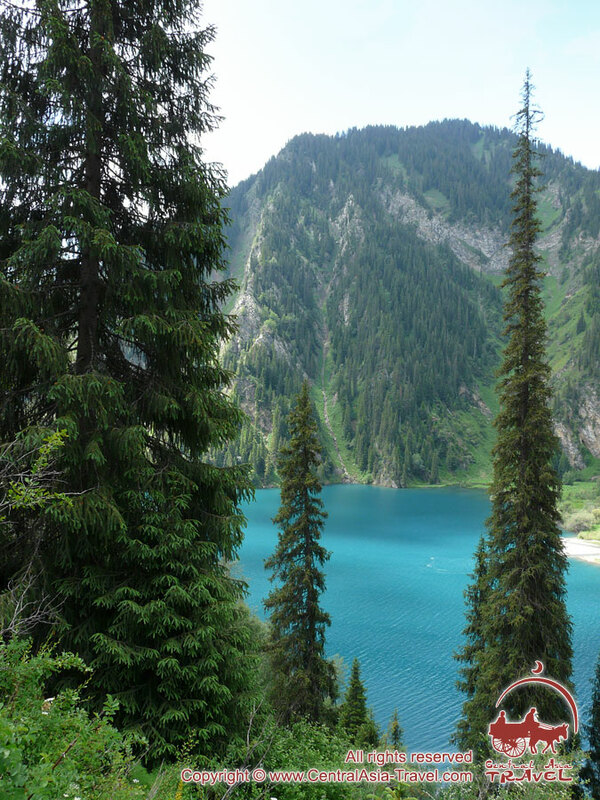 The water of Sary Chelek abounds in fish, while the surrounding slopes are thickly covered with raspberry bushes, which means we can enjoy fishing or picking the berries. 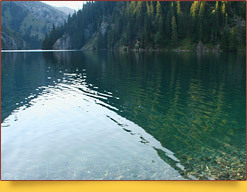 Several opinions prevail as to how Lake Sary Chelek was formed. 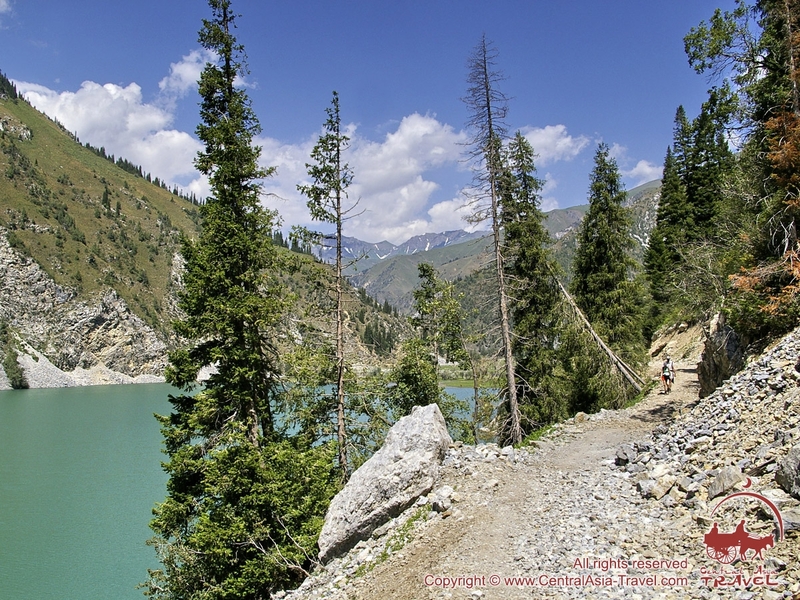 Some experts consider that the lake resulted from an earthquake, when two mountain ranges collided and produced an enormous landslide blocking the Khoja-Ata, one of the tributaries of the Kara-Su River. 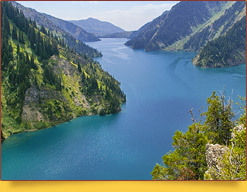 Others guess that the lake appeared in consequence of a change in a fault line, which happened about 2,000 years ago. 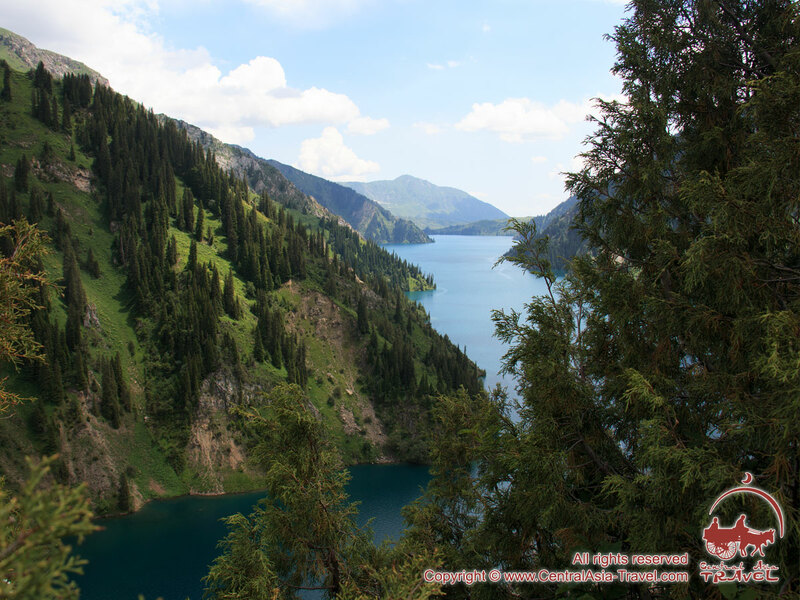 The lake’s name can be translated from Kyrgyz as ‘the yellow vessel,’ ‘the yellow bucket’ or ‘the yellow bowl,’ the name being only appropriate in autumn, however, when the leaves of the surrounding trees grow yellow and the lake resembles a bowl of honey. In summer time the water is usually greenish-blue. Old people say that the lake once had the form of a bucket, and the epithet ‘yellow’ grew from carpets of buttercups spreading in spring on the slopes of the mountains and being reflected in the water. There exist a couple of interesting legends connected with the name of the lake. One of them is about old man Sary, the keeper of the lake, who once lived on its shore. For the whole of his life he would weave beautiful baskets in the form of a bucket from willow twigs and give them to people. The area around the lake. The Sary Chelek Reserve. 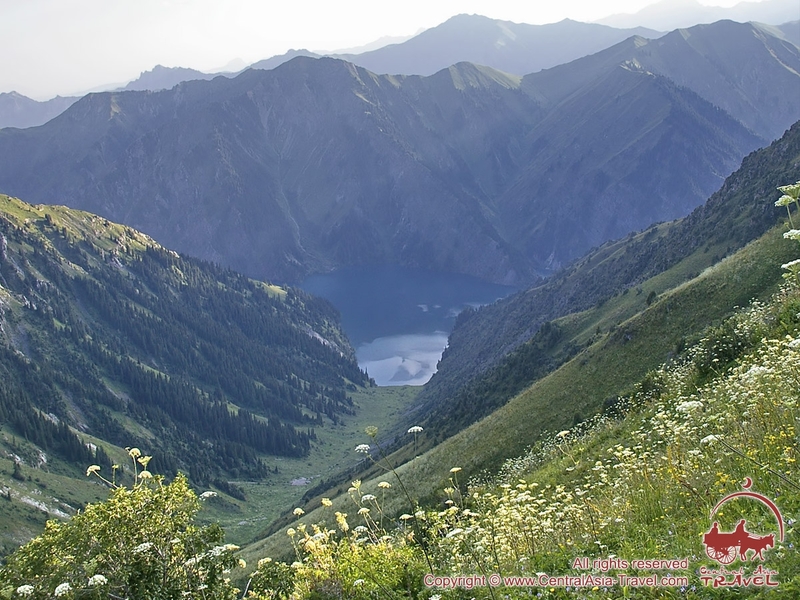 Lake Sary Chelek occupies the northern part of the Sary Chelek Reserve, one of the most remarkable places in Kyrgyzstan featuring wonderfully beautiful and diverse landscapes. 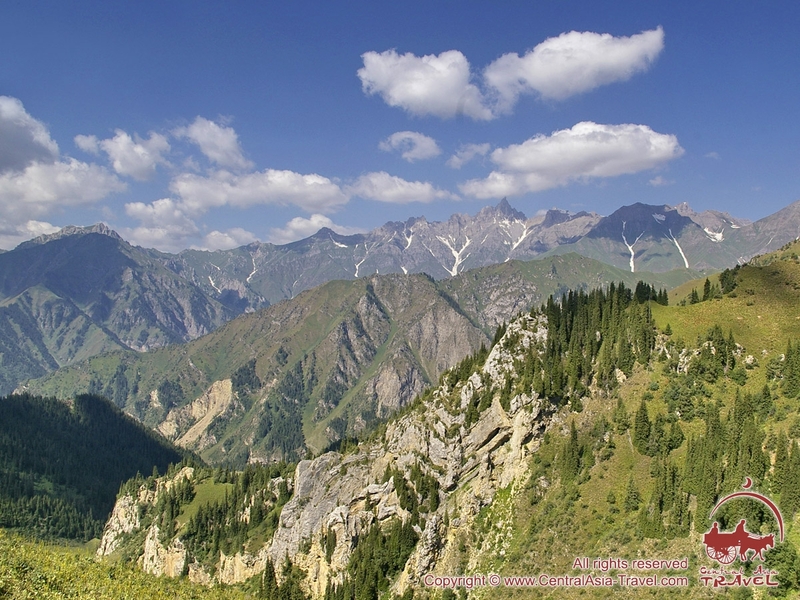 Steppes at the foot of the mountains and mountain ranges with snow-capped peaks, wild rivers and quiet swamps, mountain lakes enclosed in multi-coloured steep rocks and flowering valleys, mountain taiga and alpine meadows - all these are capable of producing an indelible impression. 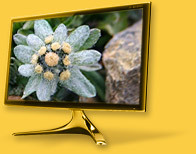 Forests of fruit trees, and particularly walnut, are a real beauty of the place. 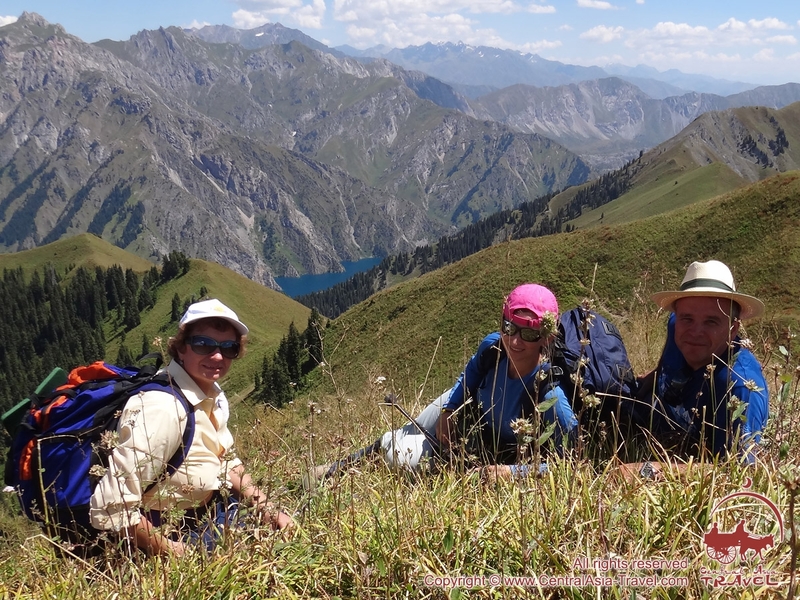 The Sary Chelek Reserve contains a number of very rare animal species, which any zoologist would consider a good luck to encounter in the wild. The ibex, which is called teke in Kyrgyzstan and was once quite numerous, is one of them. Many consider ibexes fabulous animals, and to encounter one is a sign of happiness and luck. 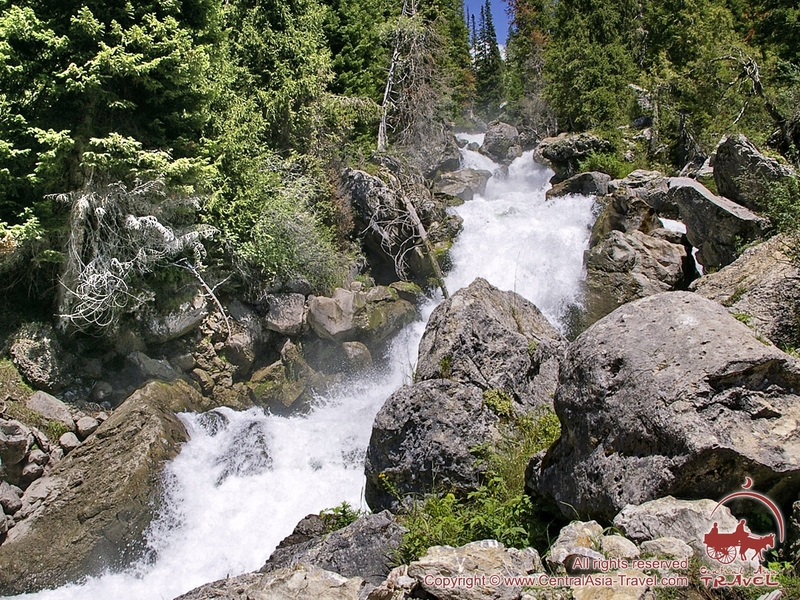 The reserve and adjoining territories include river valleys with steep walls and numerous boulders, where the streams form rapid cascades and picturesque waterfalls. 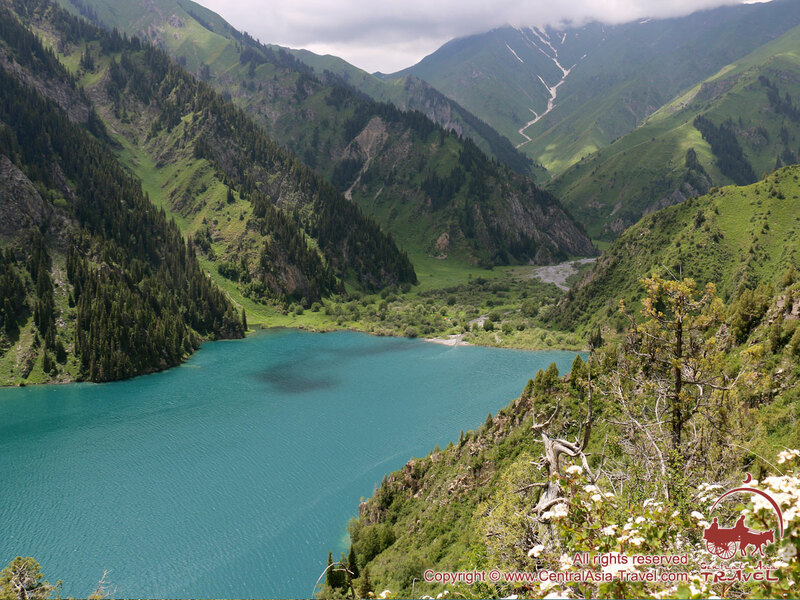 North of Lake Sary Chelek there is a region called Kara-Toko (‘kara’ translates as black and ‘teke’ as ibex; the black ibex is a legendary animal the size of a horse and with gigantic horns) - a territory including several alpine lakes, one of them bearing the name of Kara-Toko. Above and below it there are two other lakes, Blue and Turquoise, which are rather small but no less beautiful. And in the Kara-Toko Gorge proper, at an elevation of 3,000 m, scientists found unique rock paintings depicting wild animals. 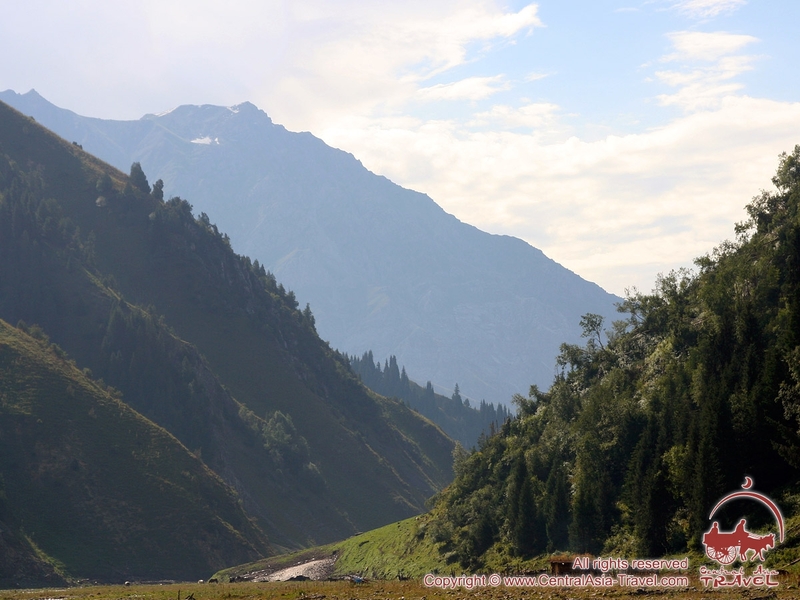 This region also features the largest glaciers of the Chatkal Range and the most complex passes. 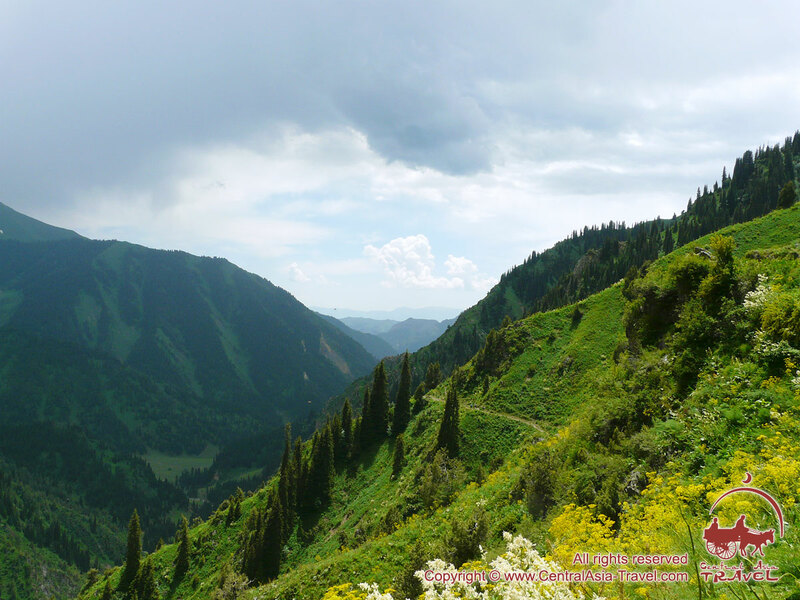 Trekking across the Chatkal Range you will be impressed by the beauty of the mountains. The area is an attraction for pilgrims, as the lake itself since ancient times has been regarded as a holy one. 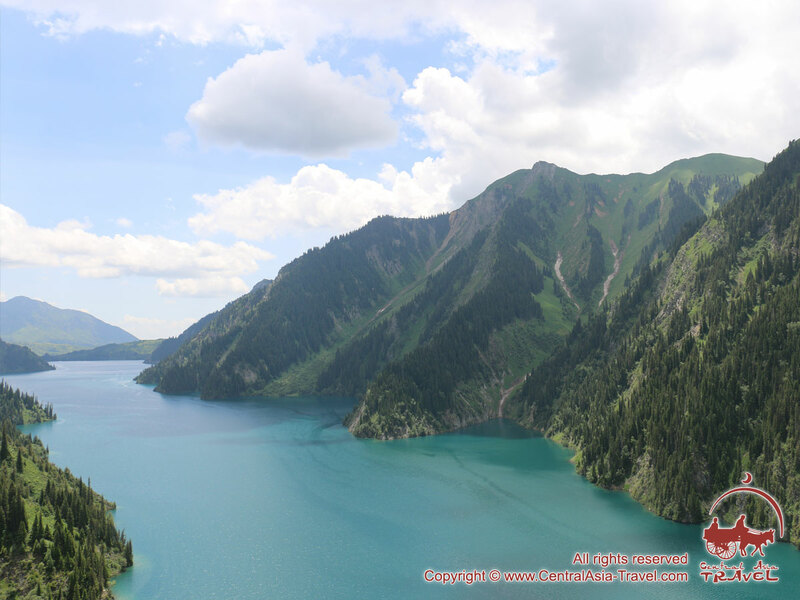 The Toskool-Aty tomb, a place of pilgrimage for Muslims, is situated on the southern shore of the lake - the grave of holy Toskool who, according to legend, hit the mountains with his staff, which then fell to form a lake. This holy place features two mosques and a spring running out from a thick poplar grove. 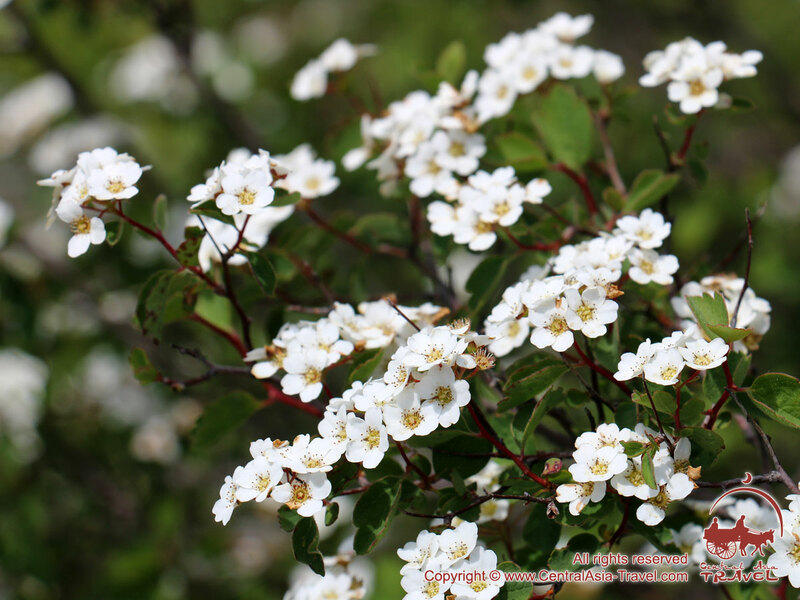 Its water is considered curative, able to heal ulcers on the body and soul. Once there was a community of Buddhist hermits, arhats. 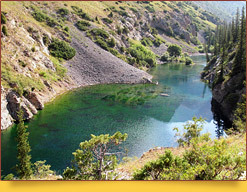 To the southeast of Lake Sary Chelek there are several other small lakes - Kyla-Kol, Iri-Kol, Chocha-Kol and Round. All of them resulted from landslides, which dam-like blocked a river. This highly picturesque chain of mountain diamonds will always attract those loving wild nature.